There are a lot of fall crafts ideas. Just imagine setting in your cozy craft room and it is getting cold outside. Fall can really get you into the crafts mood. The children are all back in school and you have some time for yourself. There is no better time to bring out your craft ideas and getting ready for the season. With the leaves turning colors and rain coming in (I live in Oregon and we get rain) the mind naturally turns to crafts you want to make. Also, Christmas is not far away and maybe you need to make some new decorations or even make your homemade presents. Now is the time to get busy on them. Now is a good time to take a nature walk.You can collect fallen leaves, pinecones and other autumn findings. Stores will start having sales on Halloween and Thanksgiving paper goods.Now is the time to buy them while they are on sale. A great way to spend the day is at the beach after a storm.You can find all kinds of driftwood and sea shells to use in your crafts. Bring some fall colors into the house.Wire some autumn findings to plant pokes and add them to plants and floral arrangements. Decorate your house.Fill candy jars, small tins and baskets with candy corn and mixed nuts. Welcome your guests.Gourds and pumpkins arranged near the front porch or along your walkway just say "welcome". Candle arrangements.Remember to replace your summer candles with your fall candles. Stock up on supplies.After Halloween is over, watch for sales on holiday craft supplies and stock up for next year. Make arrangements of gourds and pumpkins and scatter some fall leaves with them.You can also scatter some leaves on your table or in your hutches. Sit back and cuddle up with warm throws (that you have made yourself) during the cool nights. 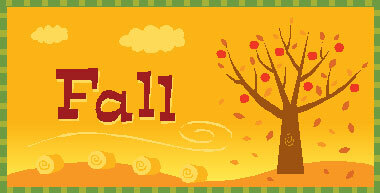 If you have any questions or fall crafts ideas please contact me and I will add it to my site.